Once you are approved as a prospective adopter, the next step is to be matched with a child who could thrive in your family. Your social worker is responsible for seeking a potential child among those who are currently waiting. Some prospective adopters are matched with a child quite quickly, but for others it may take longer. During the last year, there has been a reduction in the number of children for whom the courts are recommending adoption. 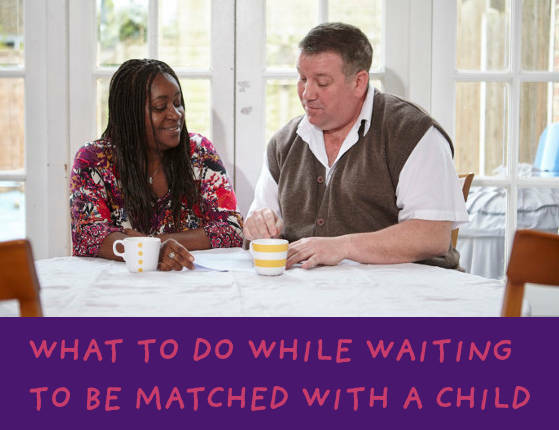 Currently most approved adopters are being matched within 6–12 months, but for some it may take a little longer. Watch our ‘Meet the Adopter’ webcast to find out how one adopter was dealing with the wait as well as expert advice on how to manage this difficult time from a social worker. If you are approved by a local authority adoption agency your social worker will first look to see if there are children waiting for a family within your agency. Your adoption agency may also belong to a consortium of neighbouring adoption agencies and your social worker will know of children within the consortium needing adoptive families. A voluntary adoption agency (VAA) does not have children in their care. If you have been approved by a VAA your social worker will seek a match with children currently waiting for an adoptive family. VAA’s also receive details about children who need adoptive families from local authority adoption teams when social workers have been unable to match children from their own resources. Your VAA social worker may find a potential match with a child/children in this way. One important way of letting agencies know about you and the child or children you hope to adopt is by providing a brief “profile”. Your social worker may do this with you and it should outline your ages, interests and the age of children you wish to consider. Your profile should give the backgrounds of children you could consider and any special skills or experiences you would bring to adoption. Take a look at our template with helpful tips to help you create yours. You will have discussed with your social worker the backgrounds of children that you hope to care for. Your social worker will have gained an understanding of your particular strengths, together with your experiences with children and the skills that will equip you to manage the challenges ahead. This will be detailed in your Prospective Adopter Report (PAR). Information about your ethnic and religious background will have been discussed and how you would support children from a range of different backgrounds. Adopters who would consider the early placement of children through schemes such as Fostering for Adoption including Concurrent Planning. Sometimes there isn’t an appropriate match with your family in your local area and so your agency will need to cast their net wider. Link Maker is an online service that allows adopters and family-finders to add profiles of families and children waiting online and search for potential links. Adopters can receive enquiries from social workers through the system, and make their own enquiries about children. Link Maker, a social enterprise founded by adoptive parents, and operates across England, Scotland, Wales and Northern Ireland. Approved adopters can make their profiles available free of charge, including photos and video. Adoption Activity Days are organised events that give approved adopters, or prospective adopters at an advanced stage of approval, the opportunity to engage with children who need adoptive parents, in a safe, supported and fun environment. These events allow the children and prospective adopters to interact through fun and enjoyable activities such as face painting, climbing, craft and soft play. Children are very carefully prepared by their social workers and foster carers and the emphasis is on having fun, not finding new parents. Adopters are offered a lot of support and somewhere to have time out if the emotion of the day gets too much. Adoption Activity Days are organised by Coram – in partnership with some councils and voluntary adoption agencies. Speak to your adoption agency to enquire about any local Activity Days or contact Coram. Your social worker will discuss possible children with you and will send your details to social workers of potential children waiting. If there are possibilities you want to explore further then your social worker and the child’s social worker will exchange more detailed information. This will include fuller details about the child’s early experiences and developmental progress. You will then discuss this information in detail with the two social workers before any decision is made to recommend a match. The child’s social worker may visit more than one family before deciding which family could best meet the child’s needs. If you and the social workers wish to proceed with the potential match with your family, then it may be possible to meet with the child’s foster parent to find out more. It is unlikely that you will meet the child until after the match is formally approved. However it is now fairly normal that videos of the children in their foster homes will be shown to you during this exploratory phase. You may also meet the Medical Adviser of the child’s agency to help you understand the implications of any known medical information. Once you all agree that a suitable child has been identified your adoption agency, together with the child’s agency will write an Adoption Placement Report for the matching panel. This report will include an Adoption Support Plan which outlines the support that the child’s agency will provide depending on the known needs of the child. The match will then be presented to the adoption panel of the child’s agency. The independent adoption panel of the child’s agency will read through all the information in your Prospective Adopter Report and the Child’s Permanence Report together with the Adoption Placement Report. 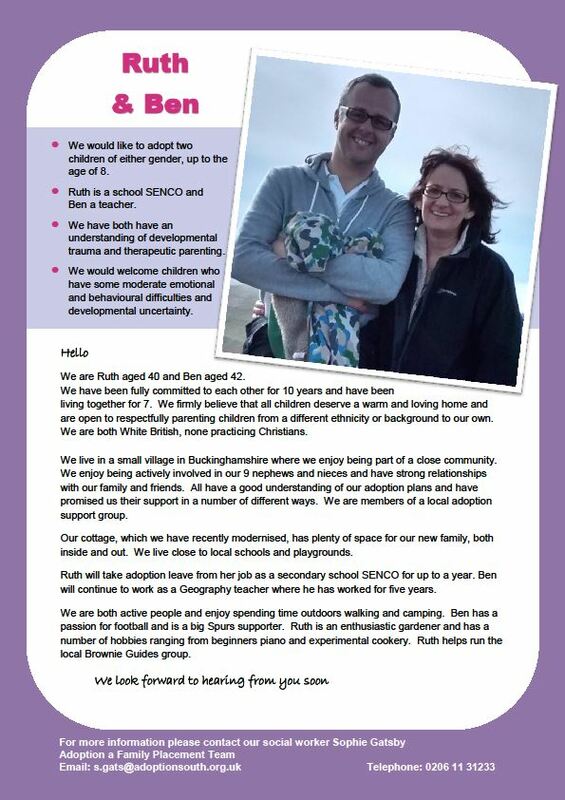 These reports will help the panel to understand more about the child’s needs and how you will hope to meet them. This will enable them to decide if you are the best match for the child. You are generally invited to attend the panel considering the match, perhaps to talk about what drew you to the child. If the panel recommends the match, the child’s adoption agency will make the final decision about whether the match should go ahead. Once the right child has been found for your family and the child’s adoption agency has given its approval, an Adoption Placement Plan is prepared. This plans out a series of managed introductory meetings where you and the child can get to know each other. These meetings will be built up over time and at a pace that is right for the child and for you, leading up to them moving in with you. Adopter Rupert talks about the first time he met his son.